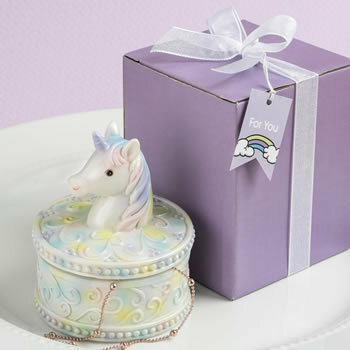 This on-trend unicorn design box is crafted from solid poly resin in a two piece design. The cover of the box features an adorable unicorn head. The cover and bottom of the box have a filigree design. A matching beaded ball design offers a stylish look around the edge of the cover and base of the box. The box and unicorn head are decorated in a delicate pastel multi color wash design. Perfect to place on a bedroom dresser to hold jewelry, trinkets, sentimental notes or change. Perfect for Unicorn Themed Birthday Party Favors or Unicorn Baby Shower Favors!